A PDF of the interview is available to download from here. A Czech translation of the interview is available here. John Zerzan's website address is johnzerzan.net. 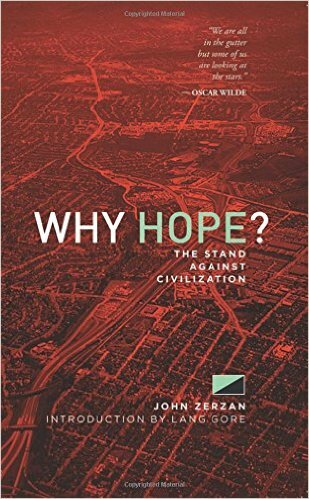 John Zerzan's latest book is 'Why Hope? : The Stand Against Civilization' (Feral House: 2015). A review of the book is available here. A large selection of John Zerzan's essays can be found at anarchistlibrary.org. What do you think is the importance of environmental festivals like Ekofilm, especially when visitors to such festival are mostly already environmentally conscious? the TV and see all of these nature shows and they'll more or less say how awful the present situation is, how it's getting worse and everybody knows that. Well, why rehearse that same old deal? It doesn't go anywhere. You need something that gives some sense of understanding. How did we get here? To me the big question is: What would we have to do to prevent things from getting worse? Things are getting worse with the same old environmental stuff - it doesn't work. So that's the open question: What do you have? You know, I'm tired of all of this nonsense about recycling or buying the right kind of 'green' crap. That's absurd, that has nothing to do with what's going on. I can tell you that in the US it's very difficult to break through the constraints, the limits, on what's respectable or permitted. Some things are just absolutely off limits. They just are. You won't get a hearing? I've been approached to be on television and so forth and everytime it's cancelled before it happens, because they take a look at my ideas and say: “No, we don't want people to think about these things. No, no.” It's amazing. It's like a Stalin dictatorship or something. And I can handle these debates; I've studied these things for years and years and I can acquit myself on the camera or anywhere else, but they don't want to hear it. It's the same - and maybe this is too far off the subject - as the rampage shootings in the US; almost every day they happen now, and the question that you cannot ask is: “What is going on, and what does this tell us about society?” No, no, no. You'd think it was the most obvious question in the world, but "no, we don't want to go there". It's very similar. It's a parallel. How bad do things have to get? I actually think that reality ultimately breaks down the door, it pushes the door open. They don't want to hear it, but if you have ideas, the accepted ideas, that are so far at variance with reality, you can't maintain it. Sooner or later I think - though I could be wrong - that that has to change, because it becomes surreal. They're saying these things that have nothing to do with what's happening, that don't explain anything. At least, I'm hoping that's going to happen. Who knows? You think the main era when it all went wrong, when the ecological crises began, was the Neolithic revolution. Is it not unfair to say that traditional agricultural societies exploited nature? Well, in a way, you could say it's a relative thing. Traditional agriculture is very much a barrier to industrial, mass agriculture. Understood. But the real turning point is the qualitative one, domestication itself. So if that is problematic, which I think it is, then really any form of agriculture, any form of domestication, is already domestication, which opens the doors to the horrors of today. You get rid of the top soil, you raise food that has no taste, and fifty other things that we know about. What do you think of the concept of the commons, which was criticized by Garrett Hardin in his book 'The Tragedy of the Commons'? The concept is that we can live in small communities and live sustainably. I'm not familiar with that or Garrett's critique of that, sadly enough. But I think there are some very excellent experiments. We need the practical skills. We need to try things, restore the land as much as we can. For some of us, one source - in North America, anyway - is learning what indigenous people did. What did they eat? What was the so-called 'edible landscape', which is pre-domestication? But I think all of these things we can learn from. I know people that do restoration work. It's all to the good. But I also think you need a vision and a direction, otherwise it remains somewhat limited. You have these nice experiments, but can't we use those to go further? To maybe go in a sort of anti-domestication way, in that direction? It is a practical map, you know; it isn't just theory. If you don't have the skills, if you don't know how things grow and how to recognise these different plants, and all that stuff, well, then, you're not serious. You have to get your hands dirty and see how it works. Do you know of any communities that have decided to live like hunter-gatherers? The opportunities to do that now are extremely limited. I think that ultimately it will be possible, if we can reverse some of these tendencies, including the unnatural population, which is so largely a function of (a) domestication and (b) industrialisation. If that's what causes the really out-of-balance population, then if you remove those two things, then the population starts to go down, probably. But the experiments are somewhat limited because now everything is working against it. It's just very difficult. I know people who are pursuing these things in North America - they're trying to see what can be done, without a whole lot of capital. They don't have a huge amount of money to buy a huge amount of land, but they're going forward to tackle these things, in a practical way. What do you think about eating animal products? I'm still trying to improve my personal approach to that. I don't eat red meat at all, but I'm not exactly a vegan either, though I have a huge respect for that perspective. I guess also part of it for me is the historical thing. As homo species, we started cooking meat almost two million years ago, and I'm always wondering: “Do vegans think that humans were completely wrong or evil because they were eating meat?” It's one thing to attack the slavery of domesticated animals, of course, but I don't know if that will rule out any kind of hunting, for one thing. That's what we were doing for millions of years. They don't like to look at that as an historical question, I think. But I'm not an expert on this. I'm intrigued by the vegan point of view, I can at least say that, though I'm not a vegan. I think it's very good to go in that direction, away from animal products. We don't need that now, and maybe we won't need it in the future either. But I don't know. What do you think of so-called freeganism: the practice of collecting discarded food and re-cycling it? I think it's a great idea. It always bugs the Left quite a lot - you know, 'that's just bourgeois', or whatever. But, well, why not do that? It gives you the freedom to do other things. That's the way freegans I know look at it. I could spend my time working, being a wage slave, or I could go to the dumpster and get all of this food that they're throwing away, and then I have time to do other things that are more interesting. It makes sense to me. In the US, they throw away perfectly good food - it's outrageous. Anarcho-primitivists consider technology to be evil, but at the same time they use technology to spread their ideas. Are they hypocrites? The way I look at it is: Where's the free choice? Sometimes I'm told: "Well, if you were really a primitivist you'd live in a cave. You wouldn't be doing a radio show that streams all over the world." That's sort of true, but how can you make a contribution if everybody's online. If you don't have email, you're not in communication with people. I don't like it, but I'm not just going to sit in my room and sulk, or go off to a cave and ignore everything. I try to point out that contradiction. Actually, I know people - you know, green anarchist types who I totally respect - who don't do email. They refuse. But as every day or week or month goes along I realise that they - and I'm in contact with them - don't know what's going on. They just don't. I couldn't do my weekly radio show without all these sources that depend on technology. We wouldn't even know about the crisis of the environment. It's a sad situation that we're so removed, that we can't have the direct contact, but at the moment that's the way it is. So it seems a little privileged to just say: "I refuse". It doesn't get you anywhere. But it's a continuing discussion. In fact, I have friends that completely refuse to have anything to do with media - pretty much any media. But we're trying to start a dialogue, we're trying to have more communication, and if you are too pure to talk to people, what's the point? That goes under the heading of 'practical needs of the anarcho-primitivist movement'. We have a chance to discuss things and spread different perspectives that maybe people haven't heard of, haven't thought about. How do you do that? I remember, well, writing letters. Obviously, now, people don't write letters. When I first started doing public speaking I wrote to a friend who'd done a lot of University speaking, and I said: "Can you share with me some addresses so that I could write to them?" There was this pause and he said: "Write to them?" And he knew I meant 'write a letter'. He said: "You're an idiot. You can write them a letter, but you won't get an answer. They won't have the time to write you a letter." And I was really depressed - I didn't realise that it had already gotten to that place. So then I said: "Well, I'm going to have to surrender my virginity - I'm going to have to get an email account like everybody else, and that's the way it is. "As soon as we get rid of that, I'll be happy. But here we are. People don't even have face-to-face communication anymore. It's pathetic, it's awful. You're interested in the problem of domestication. How do you think we can reverse the process and de-domesticate ourselves? That's probably one of the most difficult challenges. what do we mean by re-wilding or de-domestication? What would that involve? That's pretty much a staggering thing, but there it is: If you don't want to accept domestication, then by definition what you want is de-domestication - a wild and free approach. You know, people: they survived, they ate, they had variety, they had even better quality of food, when it was wild. You know, that's something that's hard to imagine. "Wild wheat? Well, the wheat has got to be farmed." No, it doesn't - it grows there, and it has higher protein than other domesticated wheat. These things exist in nature, and when they're suppressed, or removed, or replaced by domestication - which changes the nature of plant species (or animal species, for that matter) - that shift or change produces bad outcomes. But reversing the process of domestication - that, of course, is the mammoth thing. Noam Chomsky, for example, attacked us on this, saying, "This is madness, this is crazy: there are seven billion people on the planet. What are you talking about?!" Well, first of all, why are there seven billion people? He doesn't seem to be interested in what causes that, what drives that unnatural population. He also makes it seem like we're in favour of just pulling the plug overnight and then 'no more domestication'. Well, I don't know anyone who wants that. People would starve because we're not yet equipped for any kind of process of transition. We're just not. But it doesn't mean it's just a black and white thing. In fact, that's one of the stereotypes: that primitivists go along the hospital corridor and pull the plugs out of people on respirators. Nobody wants to do that! But does the whole planet have to die, because of the grid, because of the machine of civilization that's killing everything? There are different ways to do things. Don't rule out these different approaches, which haven't even been tried. And even though there are huge obstacles - in terms of capital, in terms of land, the whole thing - it's not out of the question. I think it's not out of the question at all. For me, what it comes down to is: Are people happy with domestication, with leading domesticated lives? I think the answer is, resoundingly, 'no'. But they're not yet aware of it, or we haven't developed it - the whole thing: “Okay, what have you got? What's the alternative? That sounds good, but what does it mean? What actual thing are you getting at to give instead of? '”But I think we're getting to this place where the whole modernity thing is just insupportable. It's getting more and more nuts everyday. As an American, I'm acutely aware of these shootings. I talk about them almost every week on my radio show. It's getting worse everyday and it's spreading to other countries. Of course, it's not just the shootings - it's a lot of things, a lot of pathological outcomes, from more and more domestication. It's hard to argue that that isn't so. It is so, but it still could be kind of a dead end. Because you hear this too: "I agree with everything you're saying. All these ideas are very valid. The observations are correct, and so forth. But you might as well argue against the sun coming up. In other words, you can't do anything about it, let's face it." That's the attitude that has to be overcome. It's the will to break out of this. And if you don't have that, well then nothing is going to change. You just keep taking more pharmaceutical drugs, and stumbling through the day, and hoping you won't get shot by some maniac. What kind of life is that? I think of parents with kids, our grandkids - what kind of life do you want for them? It's getting worse by the day. It really is. The main topic of this year's Ekofilm festival is handling waste. What do you think we can learn from hunter-gatherer societies about this topic? They were not at liberty to waste anything. Their survival depended on their coherence as a band society, where everybody had a part to play, and they simply didn't have the inclination to throw away things like we do - of course they didn't. So you don't find the pollution, the detritus, the leftover mountains of waste like we're producing everyday. They had a wiser mode on that level, clearly I think. They had a lot of amazing solutions, in fact. The orthodox view of anthropology now - and this another point to make - sounds utopian, sounds like the invention of anarchists. Most people are not aware of this. It's a pretty rosy picture, which is helpful. Many times I've been approached by students, who come up and say, "I was very sceptical about what you were saying last week. It couldn't have been so nice in pre-history, relatively speaking. What you were saying must be some fantasy." Well, later they come back and say, "I'm taking basic anthropology one and our teacher said exactly what you said about pre-history." You maintain a positive outlook with respect to the future and believe that we must hope, without illusions, that everything is going to get better. Why do you think nihilism, pessimism, and despair are fashionable postures in modern society? Well I hate to fall back on this cliché, but I think some of it is just generational. I was a child of the 60s, and I'm still somewhat infected by that. It was, at least for a little while, pretty magical. Kids who grew up in the 80s and 90s didn't ever see anything like that. I know there's a lot of cynicism, nihilism - "We're doomed, we can't do anything". It's understandable. You look around and everything keeps getting worse. You can see it with anarchists too. One thing I was surprised about, which I began to notice in the mid-to-late 90s, was that there were anarchists ready to fight who didn't think they were going to win. I remember, in fact, one kid saying to me: "You don't think we're going to win, do you?" I didn't say anything, but I thought to myself: "Well, why would you take these chances if you don't think so?" I was kind of baffled, because you can go to prison, you can get your head beat in - it's not a game. Sometimes it can be a game, of course, but it can also be very serious. Thinking about it, I thought: "Well, I have a lot of respect, because he doesn't think it's possible to do, to change, but they fight anyway." It might appear that anarcho-primitivism is just another "ideology on the market." 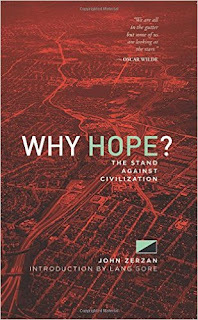 But rather than an ideology, it is an analytical tool that can be used to put things into perspective, to show that we have lived for millions of years without the need of civilization and domestication. I think it's an important thing to try - and I don't know how possible it is - to keep anarcho-primitivism open, not a closed realm of ideas, an ideology, but to keep asking better questions, perhaps, to keep it moving.